Proctor & Gamble and Whirlpool may soon be giving your neighborhood dry cleaner a run for its money. The laundry-care experts have buddied up to unveil a "revolutionary" new at-home clothing-care system that claims to steam out wrinkles, neutralize odors, restore stretched-out fabrics, and extend the lives of your garments in just 10 minutes. Designed to fit discreetly in a bedroom or closet, the "Swash," uses a combination of heat and Tide-powered detergent pods to work its magic—no water or plumbing necessary. P&G and Whirlpool say that many of the people they’ve polled are reluctant to launder high-maintenance or embellished items, resorting to “unique” measures like showering with denim or freezing cashmere, instead. That or they end up racking up more than $750 in dry-cleaning bills every year. Swash, according to Pierce, gets clothes ready to wear quickly, effectively, and without requiring extensive resources. “In the amount of time it takes one to shower, clothing will be ready to wear,” he adds. The time-saving nature of the appliance is certainly a draw, as are its claims to restore fit and remove creases. Make no mistake, however, those pants you’re “Swashing” better have some deep pockets. The unit itself costs $499, while each 12-pack of pods rings in at $7; that’s a sum that could quickly add up depending on how often you’re using the device. Still want to splurge? 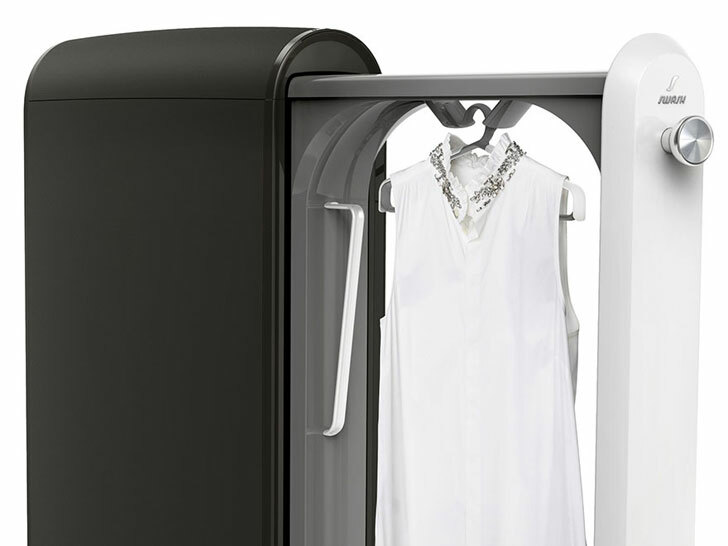 You can buy Swash at Bloomingdale’s, Best Buy, and Bed, Bath & Beyond starting September. Delta will also be fitting the appliance in select Delta Sky Club Lounges for passengers to use later in the year. P&G and Whirlpool say that many of the people they've polled are reluctant to launder high-maintenance or embellished items, resorting to "unique" measures like showering with denim or freezing cashmere, instead. That or they end up racking up more than $750 in dry-cleaning bills every year. “We have talked to thousands of people over the years that have told us they are yearning for a better way to care for clothing in between laundering and dry cleaning," says Charles Pierce, group president of P&G New Business Creation, in a press release. "Until today there hasn’t been an effective solution. I am thrilled to share that Swash is just that and more." Swash, according to Pierce, gets clothes ready to wear quickly, effectively, and without requiring extensive resources. "In the amount of time it takes one to shower, clothing will be ready to wear," he adds. The time-saving nature of the appliance is certainly a draw, as are its claims to restore fit and remove creases. But make no mistake, those pants you're "Swashing" better have some deep pockets. The unit itself costs $499, while each 12-pack of pods rings in at $7; that's a sum that could quickly add up depending on how often you're using the device.